These two boys visited the temple today with their family. They were so genki (元気 – lively), it has been a long time since I have seen kids like that. Our head gardener had to stop them from climbing a tree! They seem to be like two characters from a novel or a manga. Anyway, when they saw me cleaning the stairs, they helped to pick up some fallen leaves (落ち葉 ochiba) for about ten minutes until I asked them if their mum knew where they were and if she is not worried. Then they took off. 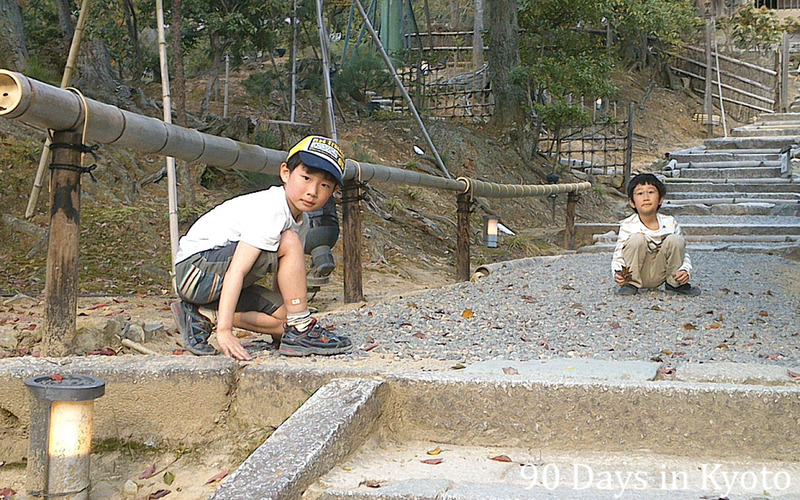 Two brothers in Kodai-ji temple helped me to collect leaves from the gravel.